$21.5 million record verdict for a 6 year old boy who drowned while at a public pool during a summer day camp. This is the largest verdict for a drowning victim in the State of Illinois. $14 million record verdict on behalf of a woman who suffered a debilitating stroke after taking Yasmin birth control for 13 days. This is the first and only Yasmin case tried in the United States. This was the largest medical malpractice verdict in Illinois in 2014. $ 8.25 million verdict against a Chicago hospital on behalf of a family who lost their father and husband due to medical malpractice following a total knee replacement surgery. $ 7.75 million verdict against a Chicago neurosurgeon on behalf of a widow, son, and daughter who lost their father and husband due to medical malpractice following a spine surgery. $4.5 million record verdict for a woman injured by a door closer that fell and injured her neck. This was a DuPage County record for a non-medical malpractice case. $5 million verdict for a woman who suffered a traumatic brain injury as a result of a truck driver’s negligence on I-65. $4 million verdict in a medical malpractice case for the estate of a 51-year-old man who died from hypoxia, obstruction of airway and hematoma following a carotid endarterectomy. $3.157 million record verdict in Winnebago County for the amputation of a man’s left leg due to a doctor’s negligence. This verdict is the largest verdict for a leg amputation in Winnebago County. $3 million verdict as a result of medical malpractice that caused a pulmonary embolus and wrongful death of a Cook County man. $3 million verdict for a family of 14 children who lost their father as the result of a trucking company’s negligence. $1.26 million verdict for a woman who sustained an aggravation of preexisting degenerative disease in her neck as a result of a truck crash. $1 million verdict for the family of a woman who died as the result of medical resident’s malpractice. $941k record verdict for a dog bite injury to the thumb of a child. This is the largest verdict resulting from a dog bite in the history of Illinois. $6.5 million settlement for medical malpractice that caused a young woman to have permanent injury as a result of a failure to timely diagnose and treat cauda equina syndrome. $5 million settlement for the medical malpractice of a neonate that led to the amputation of a child’s leg. $4.85 million settlement for the wrongful death of a 30-year-old man who died as a result of medical malpractice due to mismanagement of an allergic response to medication. $4.75 million settlement for medical negligence that caused a man to lose his dominant arm as a result of a failure to timely diagnose and treat compartment syndrome. $4.65 million settlement for the death of a man at a South Side hospital’s negligence. $4.65 million settlement for a man who suffered a stroke due to medical negligence involving the medical mismanage of carotid disease. $4 million settlement as a result of medical negligence by a cardiothoracic surgeon who improperly performed a mitral valve repair. $4 million settlement for medical negligence that caused a severed brachial plexus nerve complex during shoulder surgery. $4 million settlement for a failure to diagnose cancer by a medical professional. $3.5 million settlement for the sudden cardiac death of a husband and a father as a result of medical negligence of an emergency room team. $2.55 million settlement for a man who suffered severe and permanent injuries that resulted from the failure of an emergency room doctor to diagnose diverticulitis. $2.5 million settlement for a man who committed suicide at a hospital. $2.5 million settlement for a stroke victim who was seriously injured as a result of medical negligence. $2.4 million settlement for the wrongful death as a result of medical negligence related to a postoperative neck hematoma following spinal surgery. $2.2 million settlement on a wrongful death due to medical negligence pertaining to the failure to amputate a leg following a traumatic industrial accident. $2.125 million settlement on behalf of a young man who died as a result of a sickle cell crisis that was improperly managed following hip surgery. $2 million settlement for a woman injured by a negligent truck driver. $2 million settlement against a hospital for the death of a man following neck surgery. $2 million settlement on behalf of a man who lost his leg as the consequence of a surgeon’s malpractice. $1.625 million settlement on behalf of a family who lost a small child due to a drowning death at a private pool. $1.535 million settlement for the wrongful death of a woman due to medical malpractice for the failure to timely diagnose and treat abdominal sepsis. $1.5 million settlement for a man who was electrocuted as a result of a power company’s negligence. $1.5 million settlement due to medical negligence which caused lymphedema as a result of performing excessive surgery. $1.3 million settlement on behalf of a woman who was injured as a result of medical negligence following knee surgery. $1.2 million settlement for medical negligence during an aortic abdominal aneurism surgery. $1 million settlement with a Hospitalist group following the death of a patient who underwent knee surgery. $1 million settlement for the wrongful death of a man due to medical negligence in the failure to screen for liver cancer. 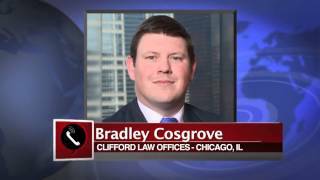 As a young Chicago personal injury attorney, Brad began his career as a trial lawyer. As a matter of fact, he undertook his first jury trial just one day after he received his law license on behalf of a woman permanently injured as a result of being hit by a car as she legally crossed the street within a crosswalk. Within five months after being sworn in as an attorney in Illinois, he gave the closing argument in a case that resulted in a $3 million gross verdict on behalf of a family who lost their father in a trucking accident. 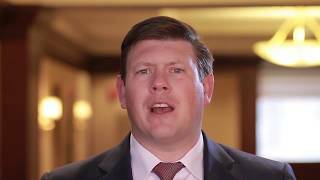 As he worked to establish himself as a leading Chicago medical malpractice and personal injury attorney, Brad was reported to be the youngest lawyer in Illinois to obtain a verdict in excess of a million dollars. This verdict was affirmed by the Illinois Appellate Court in U.S. Bank v. Lindsey, 397 Ill. App. 3d 437 (1st Dist. 2009), and the case solidified logo liability in trucking cases throughout Illinois. After Brad’s record-setting start, he continued to obtain numerous million-dollar settlements in Illinois as well as in other states. He was the lead trial counsel for a grandmother who died at Northwestern Memorial Hospital in Chicago as a result of medical malpractice, and his attorney experience benefited the client. In that case, a chest x-ray was improperly read by a resident physician and a timely surgical consultation was not requested, which caused a terrible infection that spread throughout the patient’s body causing major organ failure and death. After a two-week trial, a jury returned a verdict for one million dollars. Brad has received numerous accolades recognizing his superior trial skills. The National Trial Lawyers named him one of the Top 100 Lawyers in the country. The Law Bulletin Publishing Company named him one of the top 40 under 40 attorneys in Chicago in 2014. He was named as an Illinois Rising Star from 2006–2016. He also gives back to the profession and to the community through his work as a leader of the Chicago Bar Association, the Illinois State Bar Association as an elected Assembly member, and the Illinois Trial Lawyers Association serving on its Board of Managers, as well as through the Wounded Warrior projects that helps veterans and their families. Prior to joining Clifford Law Offices in 2013, Brad was the lead trial lawyer in excess of two dozen trials in various areas of the law. In his first week at Clifford Law Offices, he immediately appeared before a jury trial at the Daley Center on behalf of a brain injured child. Brad is extremely intense and focused, two characteristics that influence his performance as a nationally recognized personal injury attorney. He is a man who knows how to prepare for trial with a sense of purpose and organization while keeping the client’s best interest at the forefront of his thoughts. He has handled cases throughout Illinois including Cook, Champaign, DuPage, Will, Lake, Kankakee, Winnebago, Williamson, Ford, and Kendall Counties. Brad has also handled cases outside of Illinois including Indiana, Kentucky, Arizona, and Minnesota. He has argued several cases on appeal before the various Illinois appellate districts on catastrophic injury and death, and he has argued before the 7th Circuit U.S. Court of Appeals. Brad has lectured at the John Marshall Law School on expert witnesses and trial practice, topics of which he has experienced numerous times as a Chicago medical malpractice attorney. He also has been invited to speak many times before the Illinois Trial Lawyers Association on a variety of trial preparation topics. Brad was raised on Chicago’s South Side in the Beverly-Mt. Greenwood area, the son of a Chicago firefighter. In fact, helping people is in his blood – his brother and great-grandfather also are proud Chicago firefighters. He graduated from Grand Valley State University in Grand Rapids, Michigan, where he was a member of the men’s swim team. He went on to John Marshall Law School in Chicago on an academic scholarship. It was there that his love for the area of personal injury law began and where he honed his skills as a member of the trial attorney team. The trial team won the Chicago regional trial competition where Brad finished as a semi-finalist in the American Trial Lawyers Association Trial Competition in Miami, Florida. He is married and lives with his family on the South Side of the Chicago land area. 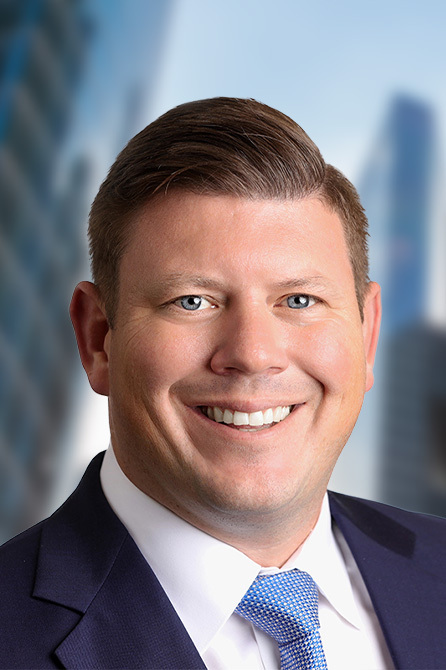 Brad Cosgrove’s reputation as a fair, tough and successful advocate for those in need has made him a proud addition to the Clifford Law Offices’ legal team as a partner at the firm.